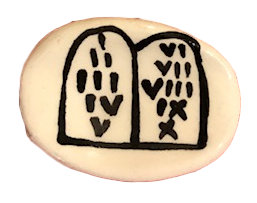 This individually hand-crafted Ten Commandments Stone is made of durable glazed pottery which can last a lifetime. At about 1.5 inches, it is sized to fit in a pocket, blessing bowl, or a faith chest. Purchase one or more to gift to others as a meaningful reminder of this moment. This stone complements the Learning the Ten Commandments Milestone Moment. Learning the Ten Commandments is an important step for a young child or those of any age. The Ten Commandments present foundational ways to love God and neighbor and provides the Christian community with vital language to shape daily conversations, conduct with others, and values and concerns. This Ten Commandments stone for gifting is a wonderful keepsake to remember the accomplishment and to love God and keep his commandments.